This blog reflects old and new books, TV shows, and movies that are of interest to me. Note: Review solely based on movie. Have not read the full novel. "Libby Day was only eight years old when her family was brutally murdered in their rural Kansas farmhouse. Almost thirty years later, she reluctantly agrees to revisit the crime and uncovers the wrenching truths that led up to that tragic night." First lets get some background. My mother, two sisters, and myself were traveling so we stopped at Barnes and Nobles to pick up an audio book to listen to. 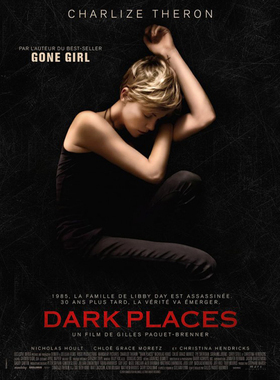 We landed on Dark Places by Gillian Flynn. It sounded interesting so we decided to give it a try. We stopped listening pretty early on. It was extremely inappropriate and dark to listen to which I was not expecting. It would have been fine if I had listened to it on my own but the fact that I was with my mother and sisters made it uncomfortable. Once I found out it was being made into a movie and the amazing cast that was behind it I decided to give it a try. Watching it on my own of course. Let us first start this out by saying this movie was much longer than it needed to be. I feel like the movie dragged on for so much longer than it needed to. We have great actors but the screen writers didn't give them that much to work with. The characters themselves aren't bad they were just lacking a lot of personality. This awful traumatic event happened and the film fails to make you feel bad. The movie makes the characters that were killed so annoying so you almost don't feel bad for them. The plot of this movie is all centered around who killed Libby's family. Her brother Ben is in prison for the murders but from the beginning we learn that may be untrue. The entire movie is dragged out until you finally learn at the end that the mother payed to have someone kill her and Ben's crazy ex-girlfriend killed her family members as well. The buildup to find out was good but it ended up being extremely anti-climactic. I actually wanted the movie to be creepier. From what I listened to from the book it was disturbing and I felt the movie lost some of that. Gone Girl was a disturbingly creepy book and movie with a mystery you were also trying to solve. However, with that movie it kept you questioning and wondering the whole time what happened or what was going on. When I walked away from seeing the movie in theaters, although I thought it was disturbing it was still an entertaining movie. Exactly what this film was missing was what the other had. Would I recommend this to others? Unless you read the book and enjoyed this than I wouldn't recommend this to others. It is definitely for adults only as the subject is dark and not suitable for younger people. Although, I believe even people who enjoyed the book wouldn't be happy with the movie either because the amount of depth it sorely lacks. With that said, not everyone enjoys the same films so if the trailer interests you than give the movie a try. Even if you enjoy the mystery behind it you'll probably still admit it was longer than it needed to be.